Stuck in a Salad Rut? Try These 3 Fresh Recipes! Many of us are 6 weeks into our New Year's resolution of eating more healthfully this year. And, if you are anything like me, you might be starting to feel in a bit of a rut, which makes sticking to your plan harder. Boredom, both with eating the same things and shopping for the same ingredients, is a sure diet derailment -- so, whether you want to eat more veggies (a source of good carbohydrates that fuel our systems slowly and steadily), eat less meat (help the environment), or a combination, get ready to re-energize your meals with my three most popular salads. Adding new options to your mealtime lineup is sure to renew your motivation, especially if you have kids and they are salad-averse. You know, where a salad consists of ranch + a vegetable. If that's the case, you'll love these 3 fresh ideas, which I'll show you how to make with short videos. 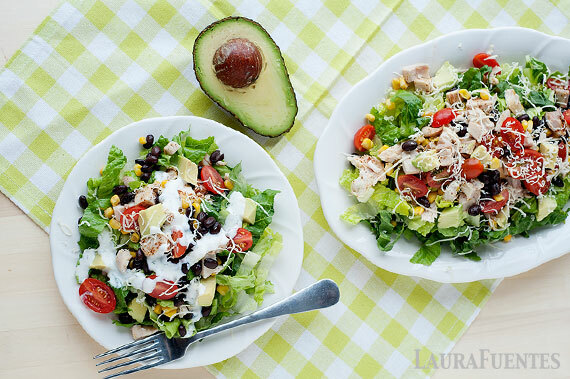 Get the whole family on the same meal plan with my fun Cobb Salad Bar. Salads don't have to be boring, and kids can be encouraged to try new things when they're in charge of their own salad bowl. (My rule: pick one item from each salad bar ingredient ... even the smallest piece of lettuce!) So, if you're looking for a bit of fun, or just a bit of agreement on what's for dinner, try this colorful, easy, and family-friendly idea. Grab the recipe here. If your kids are still unsure about lettuce (even after the Cobb Salad Bar), my Santa Fe Chicken Salad is loaded with so many nutritious foods, you'll be happy if they just eat the toppings! Check out how easy it is to make. And, the Jalapeño Ranch Dressing, while kid-friendly, has just enough kick to keep it interesting for the adults. This salad is a great way to use leftover chicken, or a good excuse to have extra on hand. You can even set up the ingredients salad-bar style like the Kids' Cobb Salad Bar. I promised, no more dull salads. Grab the recipe here. Finally, for a super-nutritious meal try my rainbow-in-a-bowl Super Greens Kale Salad with Sesame-Ginger Dressing. The more colors on your plate, the more nutrients in your system. Here, carrots, red cabbage, red onion, and edamame complement the deep green of the kale and pack loads of nutrition, fiber, and protein! The Asian-inspired dressing will inspire you to use it in all kinds of ways other than on this salad. This tasty salad also packs well for a meal on the go. OK, I know kale has a reputation for being tough, but it's also one of the most nutrient-dense foods you can choose. Kale delivers fiber, protein, thiamin, riboflavin, folate, iron, magnesium, and phosphorus, plus strong doses of vitamins A, C, K, and B6, as well as calcium, potassium, copper, and manganese--a multivitamin in a bowl! Grab the recipe here. I hope these three salads keep you motivated and energized to stick with your resolutions and add some delicious flavors to your table, as well! For more fun and easy video recipes visit Laura's YouTube Channel.